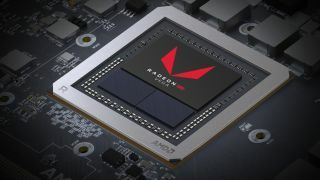 While the AMD Radeon VII is at least superficially related to Vega, it hasn’t been confirmed whether or not it’ll be an official part of the Vega II family – if he Vega II family is even a real thing. Based on what we were hearing before the Radeon VII was revealed, it lines up with what we were expecting from Vega II, so we’ll be treating it as a Vega II part, even if it’s not official. At CES 2019, AMD announced the Radeon VII, the first 7nm consumer graphics card. Launching on February 7, 2019, what we believe to be the first of the Vega II graphics cards arrived with Devil May Cry V, Resident Evil 2 and The Division 2. However, while the Radeon VII faced some supply issues at launch, AMD’s high-end GPU is now widely available. This is good news, as AMD’s Navi cards may not even show up until October 2018, even if we’ve seen some other speculation that AMD’s next cards will be revealed at Computex 2019. Either way, we’ll be sure to update this article with any new information that comes our way. In fact, laptops will soon see a flurry of 2nd Gen Ryzen Mobile processors equipped with brand new Vega graphics. Even the anticipated Xbox Scarlet Cloud could see Vega II built into its APU.